Hail to the Queen: The Lady Shogun and Her Men. The Skinny: The Lady Shogun and Her Men creates an alternate history for Japan complete with swapped gender roles, and that alone makes this manga-based film fascinating. However, the film is much less so, never convincing as more than a glorified television drama. Still worth it for the subject matter, though the manga is probably a whole lot better. Historically, the Ōoku were a collection of courtesans in feudal Japan, all dedicated to serving a single Shogun, his pleasure and prestige being their purpose in life. Fuminori Kaneko's The Lady Shogun and Her Men (a.k.a. Ōoku) turns historical fact on its ear, supposing that a mysterious plague called "Red Pox" decimated the male population by 75%. A matriarchy is established; women now handle jobs big and small, while men become homemakers and also tools for breeding or pleasure. The Shogun is now a lady while the Ōoku is filled top to bottom with a harem of gorgeous men. The problem is that the current Shogun is a young girl, meaning the men don't have to do anything besides keep the Ōoku clean and perhaps pleasure each other – if that's their way with things. Enter two factors, both bringing to the Ōoku the winds of change. First, straight-shooting yet humble samurai Mizuno Yunoshin (Kazunari Ninomiya) joins the Ōoku, leaving his childhood sweetheart Onobu (Maki Horikita) to find another husband. His initiation comes with an exposition-filled introduction to his new life courtesy of longtime resident Sugishita (Sadao Abe), but as his integrity and skill with a sword propel his rise, he slowly learns of the corruption and decadence of the Ōoku. The second factor is the sudden death of the Shogun and the appointment of a new one, the pragmatic and quietly radical Yoshimune (Kou Shibasaki). Eventually, Mizuno and Yoshimune do meet, forming a bond that could topple the inbred power structure of the Ōoku. However, with the promise of their union comes an unfortunate price. 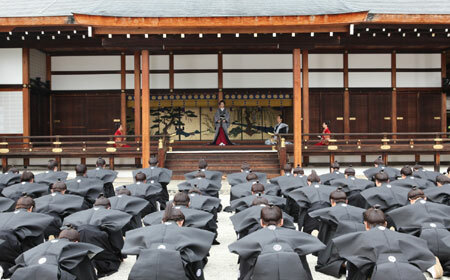 The Lady Shogun and Her Men is based on the first arc in Fumi Yoshinaga's award-winning manga Ōoku: The Inner Chambers, and its slow, talky narrative is to be expected. Mizuno's introduction to the Ōoku takes up a good portion of the film, and it would be impossible to understand the small details and subtle interactions in the Ōoku without all that exposition. The alternate Japan presented is certainly interesting, from the ornate costumes given the male courtesans to the ritualized society of the Ōoku to the consequences big and small of the world’s gender reversal. Lady Shogun is immediately fascinating because of these details, though the credit is largely due to the concept and original story rather than the actors or direction. Director Kaneko rarely raises the film above television level. Cinematography (the film was shot on HD), lighting, music, action, the works – all of it seems appropriate for a primetime J-dorama rather than a feature film.